Eric is an international syndicated columnist & broadcaster. This piece is reproduced from the 8-Jul-1996 edition of Foreign Correspondent. It is used here with permission. Please see notes after the article for information on obtaining a free e-mail subscription to Foreign Correspondent. LONDON - Eighty years ago this week, in the midst of World War I, one of this century's epic tragedies began. The war on the western front had become a gigantic siege between the deeply entrenched adversaries. The Germans were bleeding France to death in the terrible meatgrinder of Verdun. The French desperately begged Britain to relieve imperiled Verdun. And so the Imperial British and French commanders, Sir Douglas Haig and Marshall Joffre, agreed to open a second major front to the west, along the banks of the gently winding Somme River. For six days, thousands of massed British and French heavy guns, fed round the clock by munition trains, had poured 1.6 million shells onto the deeply echeloned German trench lines on the Somme. British generals promised their men that nothing could survive this, the heaviest artillery bombardment in history. Just before 7:30 AM, on Monday, July 1, 1916, British sappers fired two enormous mines, containing 200,000 lbs of high explosives, under German lines. 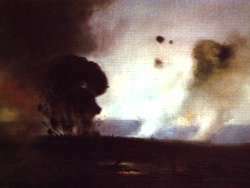 The explosions tore gaping holes in the German trenches, and were heard as far away as London. Then whistles blew and bagpipes skirrled all along the British line. The finest army ever assembled by the British Empire went over the top. Many were volunteers: The rich cream of English society from Oxford and Cambridge; miner's sons from Wales and Yorkshire; lads from Belfast's slums; sturdy Devon farm boys; and the 'Pals', groups of friends and sports teams who had enlisted under the promise of being kept together in the army units. And beside them, Imperial troops from across the vast British Empire sharpened their bayonets, khukris, scimitars and kirpans. The British commander, Sir Henry Rawlinson, was so certain there would be no German resistance he ordered his troops to march forward in parade formation. Running over ground torn up by shellfire, Rawlinson feared, would disrupt formations and tire the men. Once German lines had been seized, massed Imperial cavalry divisions, that included even the fabled Bengal Lancers and the Frontier Scouts from the Khyber Pass, waited to pour through the breach and pursue the fleeing Germans back to the Rhine. But the Germans were neither all dead, nor demoralized. Most survived the 6-day avalanche of shells in deep concrete shelters. Soldiers of a lesser nation might have run for their lives, or gone into shell shock after the hellish ordeal. Not the valiant Germans. They surfaced, set up their machine guns on prepared platforms, and poured fire into the packed ranks of the British, who were advancing ponderously in tight formation across no man's land. Somehow, much German barbed wire had also survived the bombardment. As the British became entangled in the thick belts of rusted wire, sheets of bullets from German Maxim machine guns massacred their battalions and companies. Though falling by the thousands, the gallant British continued their hopeless advance - a Balaclava writ large. Gen. Rawlinson, horrified by the German riposte, thought of calling off the attack. His superior, Haig, demanded the assault continue. This sunny morning on the Somme was the worst moment in British history. Brigade after brigade was ground to a bloody pulp. Whole units of 'Pals' died, together in the end. German machine guns grew red hot. British shells fell short among advancing Imperial troops. The slaughter continued into the evening. A few heroic British units managed to reach the enemy's trenches and storm the concrete blockhouses and fortified villages defending German lines. But the redoubtable Germans launched fierce, co-ordinated counter-attacks that drove the British back. On the first day of the Somme, the British lost 19,240 dead, 35,494 seriously wounded, and 2,152 missing: 57,470 casualties in total. The Ulster Division, which assailed the heavily fortified German right, alone lost 5,600 men that day, most before noon. The experienced French, attacking on the left, ran forward in open skirmishing formation, suffered lighter casualties, and took the lightly-manned German trenches. But they were forced to fall back when the British attack failed. Refusing to accept defeat, Haig continued the slaughter on the Somme for four more months. When he finally gave up, in November, 1916, the Allies had gained a pitiful 125 square miles of bloody mud from the Germans at a cost of 600,000 men: 400,000 British Imperial, and 200,000 French casualties. The Germans suffered 450,000 casualties. At Verdun, 1.2 million men were lost on both sides. The Somme - and Verdun - were the two greatest military follies of the 20th Century. In both titanic battles, military technology had far exceeded the general's 19th Century military intellect. In both battles, the flower of German, British and French society were cut down, robbing these nations of their future. Today, France has still not recovered from the monumental losses at Verdun. Thirty years - one generation - after the Somme, the British Empire collapsed. This is far more than dusty history. Though nearly in the 21st Century, we still have not escaped the lingering British propaganda that Germany was alone guilty for World War I. The ensuing post-war humiliation and economic ruin of Germany led directly to Hitler, and World War II. Events of 1914-1918 still shape our world. The Somme battlefield, with its grim constellation of military cemeteries, stand as silent warnings of the dangers of blind nationalism and military incompetence.